I thought that I'd join in with the #mysundayphoto linky over at onedad3girls for 2015, but the photo below really sums up the end of our year so I couldn't resist joining in this week! This year marks T turning into a little boy, no longer is he a toddler, he can get himself dressed, he goes to the toilet by himself, he's started to write his own name and he is capable of making his own decisions. 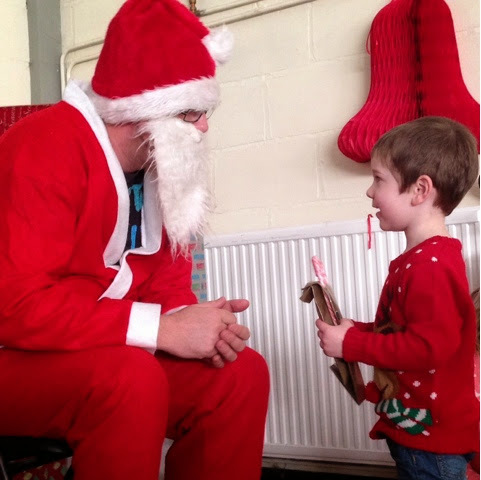 I appreciate that this is not the best photo in the world, badly cropped, a radiator in the background, a Santa with a t-shirt & glasses on and a wonky beard, but T's face just says it all to me 'I believe' not for one minute did T recognise his favourite teacher Michael, to him this was Santa, no question about it and that's what christmas has been about for us this year, filling T with wonder, belief and magic. I'd love to think that we have a few more years of this innocence but if not and some evil little child tells him 'the truth' then we've had this year! Cheers, great linky! Looking forward to joining in! Aww! Such a special photo!